THE MEMORIAL will remember and honor the nearly three thousand people who died in the horrific attacks of February 26, 1993, and September 11, 2001. 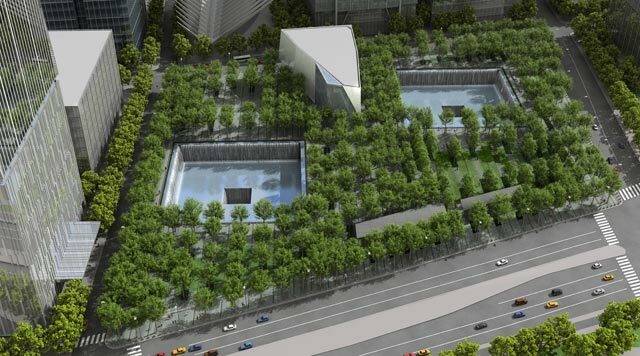 The Memorial will consist of two massive pools set within the footprints of the Twin Towers with the largest manmade waterfalls in the country cascading down their sides. They will be a powerful reminder of the Twin Towers and of the unprecedented loss of life from an attack on our soil. The names of the nearly 3,000 individuals who were killed in the September 11 attacks in New York City, Pennsylvania, and at the Pentagon, and the February 1993 World Trade Center bombing will be inscribed around the edges of the Memorial pools. The Memorial pools will each be nearly one-acre in size. The names of the victims will be inscribed on parapets surrounding the pools, within groupings that will allow for family members, friends, and co-workers who shared life’s journey and perished together to have their names listed side by side. An eight-acre landscaped Memorial Plaza filled with nearly 400 trees will create a contemplative space separate from the sights and sounds of the surrounding city. THE MISSION of the Memorial Museum, located at the World Trade Center site, is to bear solemn witness to the terrorist attacks of September 11, 2001, and February 26, 1993. The Museum honors the nearly 3,000 victims of these attacks and all those who risked their lives to save others. It further recognizes the thousands who survived and all who demonstrated extraordinary compassion in the aftermath. Demonstrating the consequences of terrorism on individual lives and its impact on communities at the local, national, and international levels, the Museum attests to the triumph of human dignity over human depravity and affirms an unwavering commitment to the fundamental value of human life. To honor those who were killed in the terrorist attacks on September 11, 2001, as well as the February 26, 1993, attack, the LMDC held a competition for the design of a memorial at the World Trade Center site. In January 2004, the scheme Reflecting Absence by architect Michael Arad and landscape architect Peter Walker was selected. 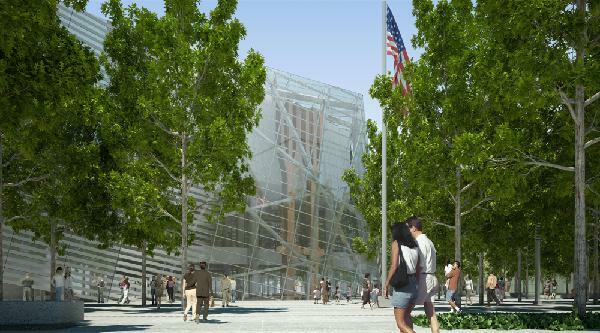 Davis Brody Bond was selected as the associate architect to execute the design of the memorial in April 2004 and was later commissioned as design architect for the memorial museum in December 2004. Intended as a solemn space where visitors can remember and honor the thousands of lives lost on September 11, 2001, and February 26, 1993, the National September 11 Memorial & Museum will feature three levels descending below ground and will provide access to the original foundation of the twin towers. In this and other ways, the designers set out to create a powerful experience that will remove visitors - physically and emotionally - from the city and everyday life. "The design strives to make visible what is absent," Michael Arad said. "The primary responsibility we have is to those we lost that day." At street level, visitors to the memorial will be greeted by a plaza filled with hundreds of oak trees, intended to create a contemplative space separate from the sights and sounds of the surrounding city. The above-ground forest will stretch across one and a half acres and have at its center two large voids - cascading pools sunken 30 feet into the footprints of the twin towers - that will serve as open and visible reminders of the absence of those lost. The entrance to the museum will be located on the memorial plaza. Visitors will descend to an orientation area and then farther down to the first main exhibition level. An extensive collection of artifacts, ranging from salvaged building elements of monumental size to modest personal mementos, will be included in the museum exhibits. At this level, the precise spot where a truck bomb was detonated in 1993 is marked. Here, visitors will be able to decide whether to bypass the most sensitive exhibits or not. The final level of the museum will reach nearly to bedrock, between the footprints of the two towers. Descending from the plaza level, visitors will make their way down two switchback ramps, each as long as a city block, that will take them 30 feet below ground into a central memorial hall. Here, the names of the victims from both terrorist attacks will be inscribed on low parapets encircling each pool. Memorial Hall, filling the space between the reflecting pools, will offer a vast gathering place where visitors can sit and reflect and events can be held. As visitors descend below the memorial voids, they will reach bedrock, where they can touch the jagged steel and rough concrete of the 70-foot slurry wall that held back the Hudson River during the attacks as well as other remaining structures at the foundation of the site. Here, at the bottom-most level of the site, a room will be set aside for quiet contemplation. At its center, a mausoleum, to be called Memorial Center, will house the unidentified remains of victims gathered in the aftermath of 9/11. A private room, too, will exist at bedrock level, reserved as a space for victims' families to gather and share their memories. A visit to the memorial will conclude in the ascent back to ground level. The design and construction of the National September 11 Memorial & Museum will be one of the most significant undertakings in the history of New York City and a focal point for the revitalization of Lower Manhattan.